My Twins....I can't believe they are going to be Seniors in August. I have said, ever since they were in utero, they keep me on my toes. They are full of energy! They are also home bodies...they have a lot of friends and are involved in many activities....but they like their down time too. We are blessed. I love that they like to hang out with us. They are a chatty duo...and have a lot to say. I feel honored to be in that place of listening. They have made me a better person. Don't get me wrong...they are not perfect; they have their teen struggles. I'm so blessed to be able to be here for them when they need a gentle place to land (and I'm not perfect either....sometimes I'm not so gentle....and I have to take a step back and pray for guidance) and that they know the door is always open for them to pour out. I try to be that safe place for them. 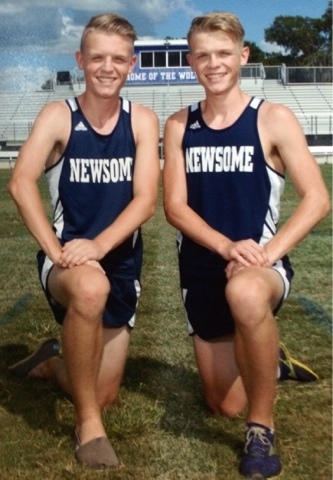 Their Cross Country photo...unfortunately it's blurry....but I love it! 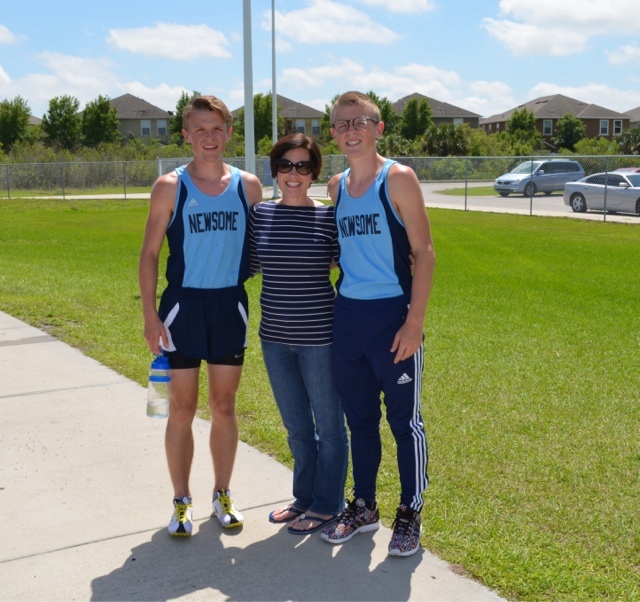 Christian had an amazing track season-- his 4X800 qualified for state. 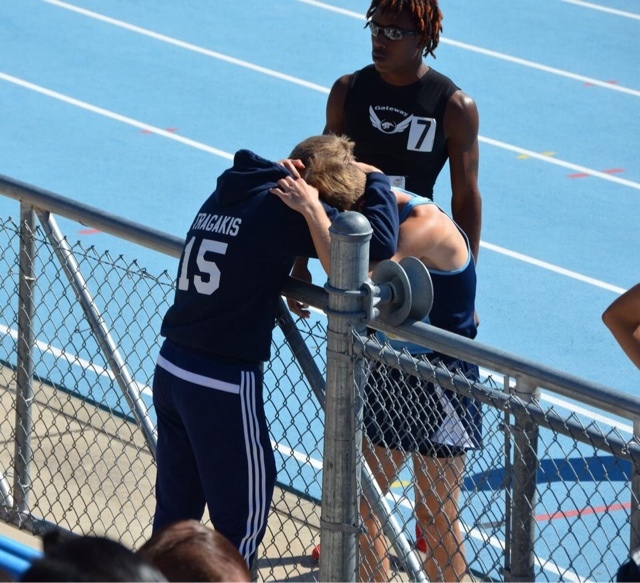 No matter where they are, the boys find each other and pray....this is before Christian's leg of the race. It warms my heart how they support one another. They are partners in prayer. Best friends. 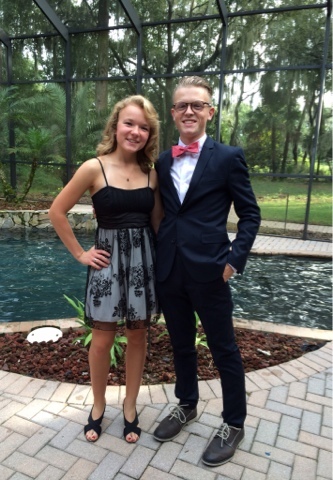 Home coming 2014: Andrew and his date, Emily. 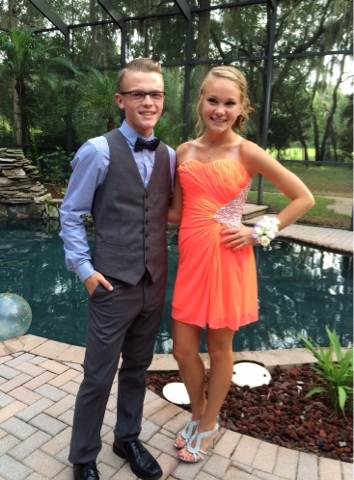 Christian and his date, Maggie. 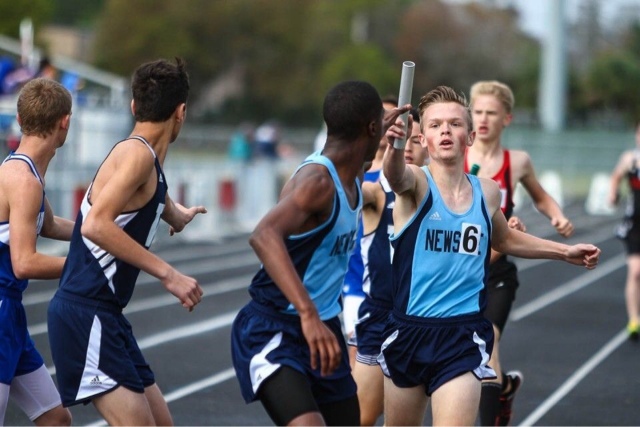 Andrew ran JV track. 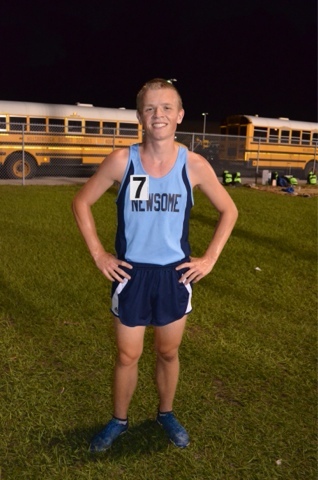 He had a good season, decreasing his two mile time with each race. A season he should be proud of. 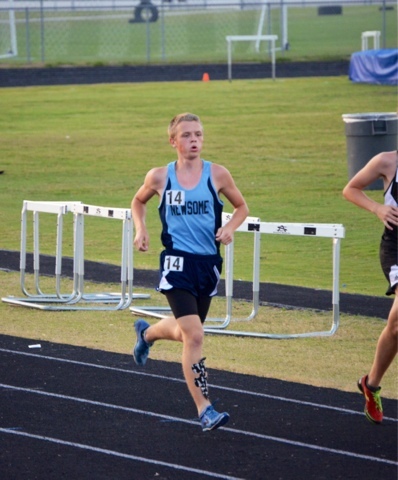 Andrew pushed himself hard this race...He ran Varsity at the district meet. 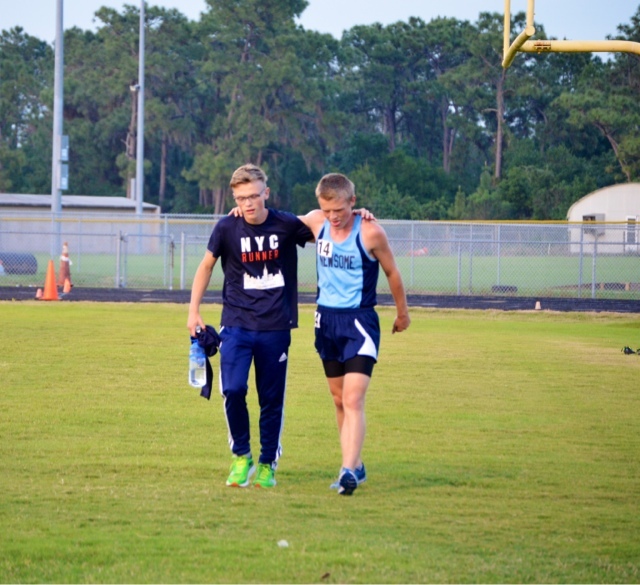 Christian was there to help him off the field. 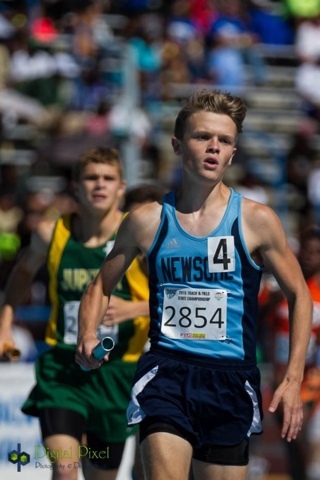 Christian- running his leg of the 4X800 at the State meet. Christian handing off to Jay...Christian was the only junior on the relay team...the rest graduated. The same was true for Cross Country season....Christian's team qualified for state in Cross Country and placed 11th...they were not ranked going into the season since it was supposed to be a rebuilding year. Their team kept getting better. They came in second at regionals and we're seeded 13th going into state. So proud of these guys! But the entire team was made up of seniors...They all graduated. I'm so excited to watch him lead his team this fall. There are some good up and comers. The boys are still in Boy Scouts. 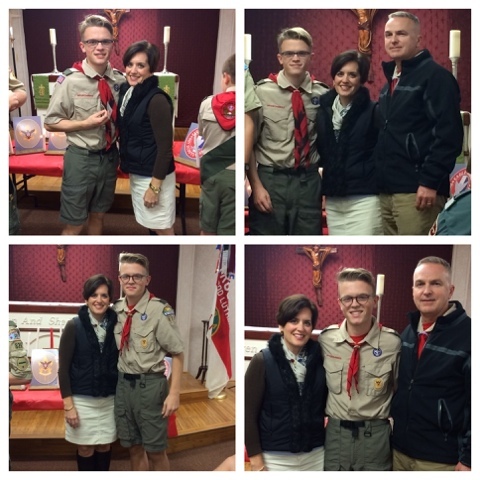 They are working towards Eagle Scout. Time in ticking. They are good with the younger scouts. The top two photos are Christians and the bottom two are Andrew. 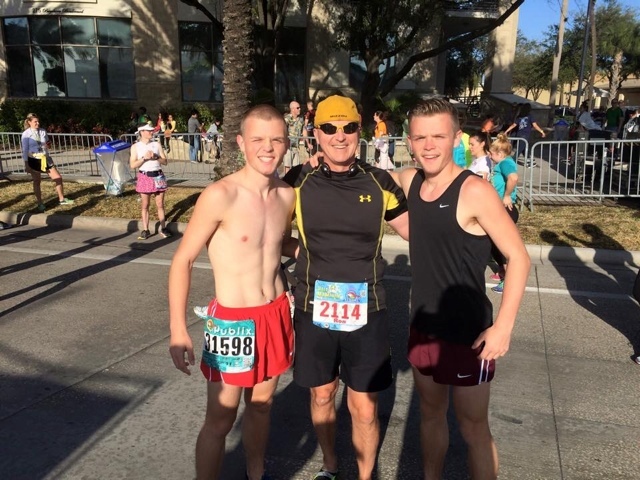 The boys ran in The Gasparilla with Ron....in Tampa, Fl last winter. Ron ran the ultra challenge. In two days Ron ran a 1/2 marathon, 15 K, 8 K, and 5K. So proud of him. The boys joined him for the 8K. They did great. Christian place 6th out of over 4,000 participants. Unfortunately he wore his number on the back of his shirt. Oh well...no oficial time out of it but he knows how he did and it felt good. He was first in his age group. The boys were in JROTC as well....last year was their last year. With their class load...they can't fit it into their schedule for senior year. I'm so glad I got a picture with all three in uniform. 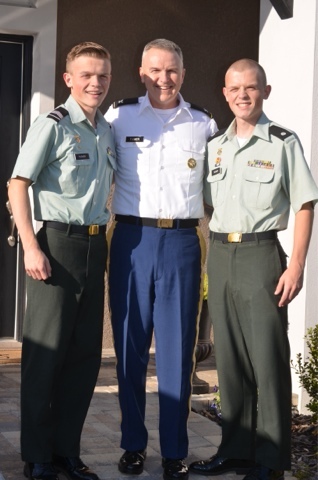 Our oldest, Adam, is an Army reservist. It would have been great for him to be here too. He's so far away....I'll post about Adam soon. 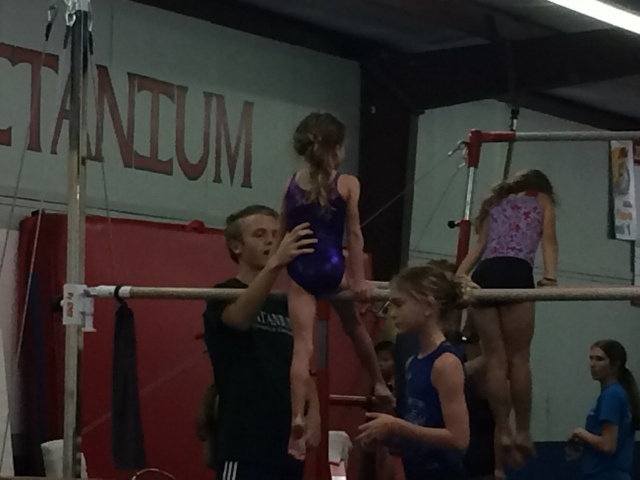 Andrew has a job....he coaches gymnastics and loves it! More grainy pictures but you get the idea. He takes after us....I coached gymnastics for over 20 years....and Ron also coached while we were dating. 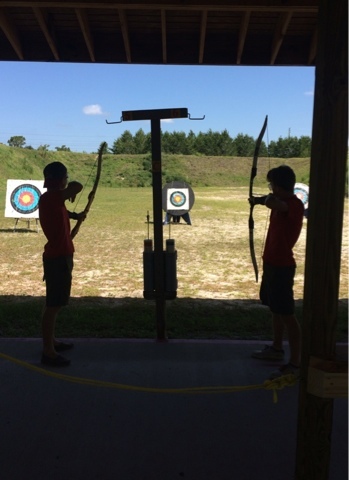 At camp in April....proving they are mirror image twins. Preppy today...I never know what they are going to wear. They love to dress. There was a full page picture of them in the year book this year...."best dressed"....it was super cute. They also dress on a budget. They get creative. Their running coach. Coach Sears. An amazing man, Christian and encourager. We love him! 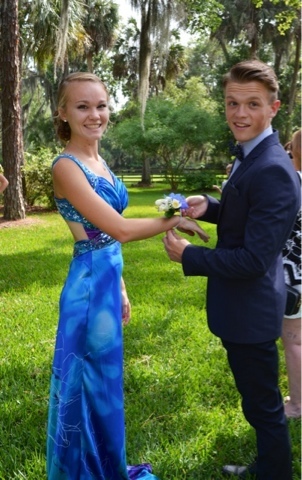 Christian took Maggie to her Senior prom. They had an amazing time. The condensed version of their Junior Year. What a fantastic year they had. Academically as well. They are good students. 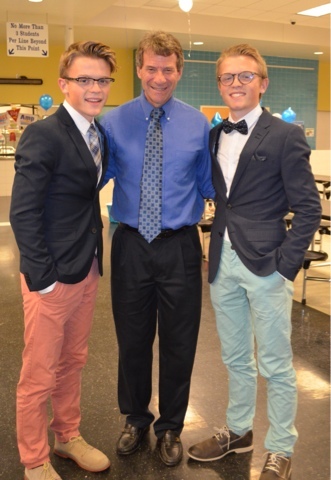 They are also co Vice Presidents of their debate team. Believe it or not....they are only separated by .2 in their GPA's. 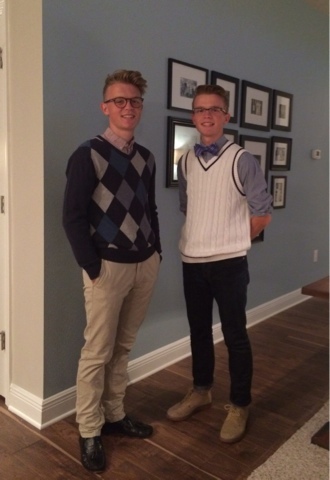 When they took their first SAT....they got the identical composite score and identical in each sub category. Crazy huh?! 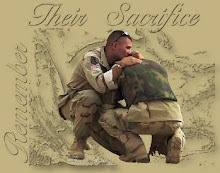 They are BRATS...a term used for military kids. Resilient! This is their 8th school. And I homeschooled them for three years. At one point, they changed schools every year for 5 consecutive years. They make friends no matter where they go. They are good kids and they are kind. I am so very proud of them. This year is going to be emotional for me....I can just tell. I'm hoping to be more diligent about my blog-- journaling to remember. It's going to go by in a blink and I don't want to miss a thing. 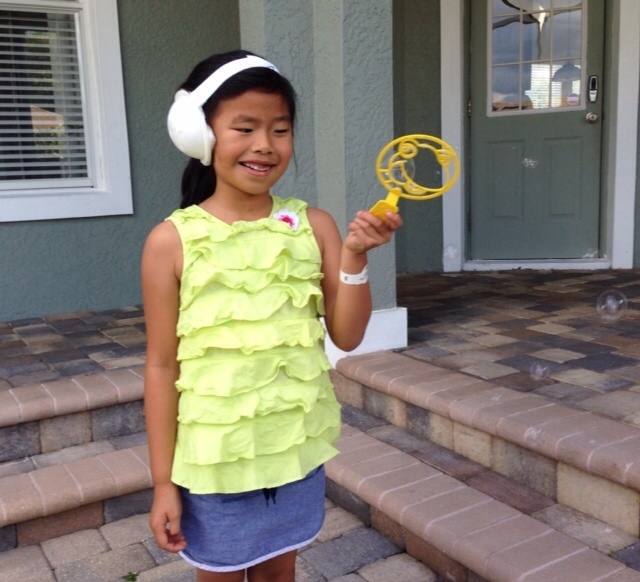 Lucey had two surgeries last year to support a bone conduction hearing aid. Part I of the surgery was in January (2014) and part II was in May of 2014. 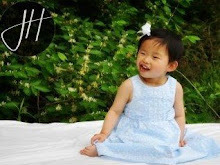 Unilateral hearing loss can be tricky. 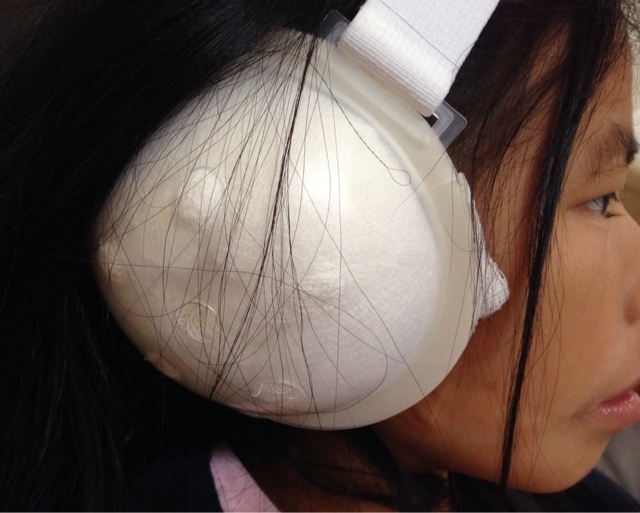 We researched the surgery and talked to four different surgeons. 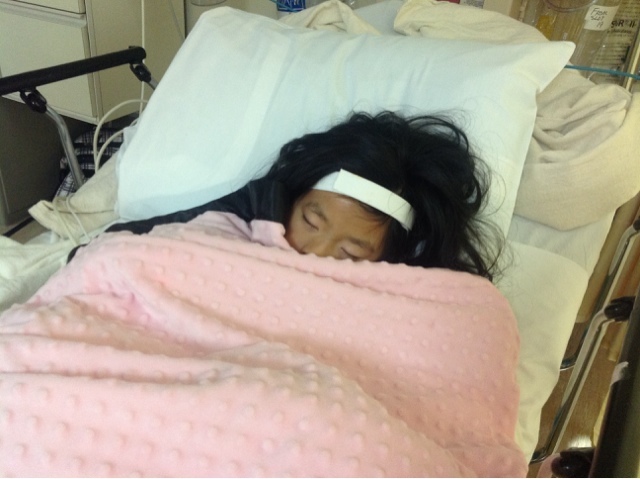 We discussed it, prayed about it and ultimately decided it was in Lu's best interest to have the surgery. The surgeon and I decided together to go the conservative route and do the surgery in two parts. Part I was installation of the titanium screw. After letting the screw osseointegrate for four months.....surgery part II was revealing the screw and adding the abutment that the hearing aid would snap on to. 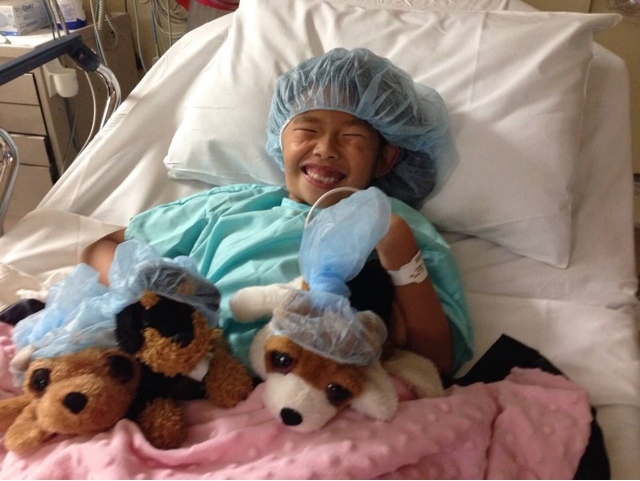 Lucey before surgery...she loves her puppies. They all went to surgery with her. 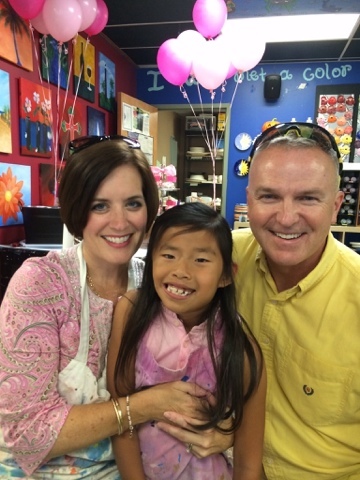 Her surgeon and anesthesiologist were a fun duo. She didn't have anything to relax her before she went into the OR. In the past, those meds made her a bit "crazy." So we decided to see how she would do without them. She did great. She doesn't do so well with anesthesia. I feel so bad for her when they wake her up. She gets dizzy and nauseous. Thankfully she moved through this fairly quickly. They make sure the area is protected. Wowza! That's a dressing! A few days later she is all set to play! One year ago she was fitted with her Oticon Ponto Plus. (We researched all of our options and decided Oticon was the best fit for her) She got the hang of snapping it on to her abutment in no time. It works amazingly well for her. I love her little smile as she hears "differently" for the first time. She hears well. 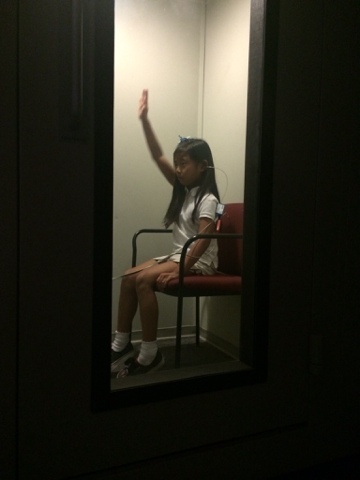 Her hearing test shows it works for her. She has not had one infection since the surgery. She cleans the abutment with a tool that looks like a tooth brush. She does a great job of caring for herself. She wears it everyday to school. It makes a huge difference. 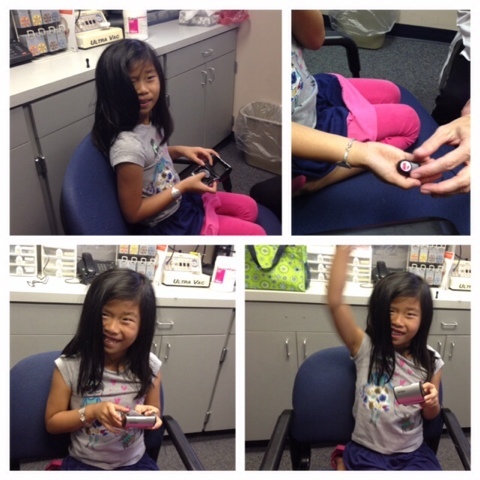 A few weeks ago she had a follow up with her surgeon and a hearing test. All went well....her surgeon said her abutment looks beautiful. Her hearing is good. Would we do it again....absolutely. No regrets! ....moved 8 times in her young life...(8 that we know of). ....has been enrolled in 6 schools. 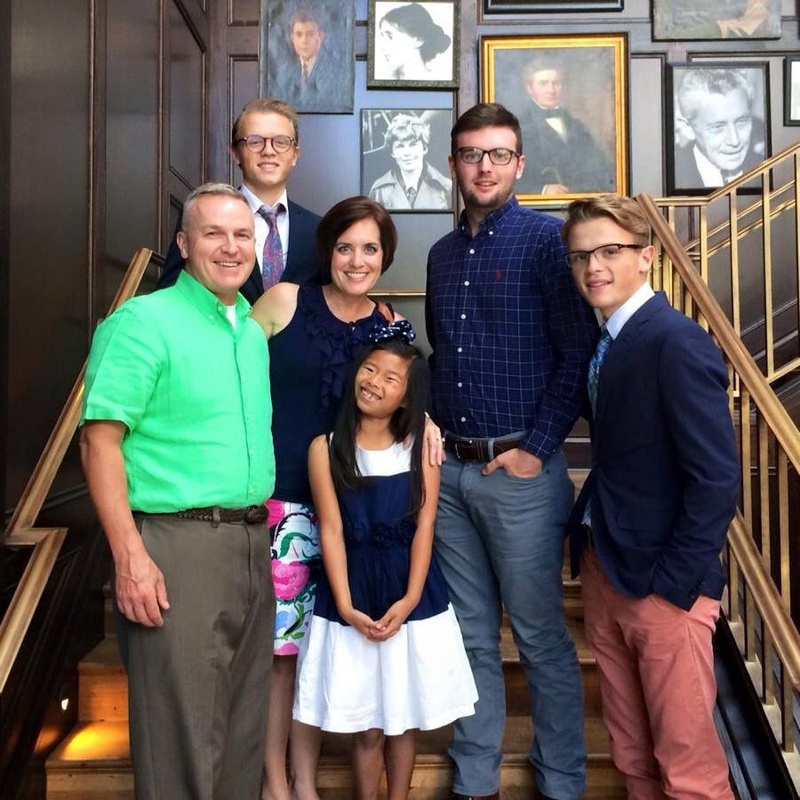 ....this summer she will travel to St. Louis for the 5th time--to see her cranio-facial team. Holding Lucey for the first time. March 2009. Last summer we moved for the 17th time. This summer is the first summer in 5 summers I will not be moving our family. It feels great! We are putting in landscape instead of organizing for a move. I can actually plan for fun. So far this summer has been pretty great. I have always loved blogging....i have missed it. If you are reading this....I am shocked. I can't imagine anyone comes here anymore. If you are reading this....thank you for stopping by!